Walsh and band mate Brianna Collins broke the news that vocalist/guitarist Adam McIlwee, bassist Dennis Mishko and drummer Pat Brier to fans via their Tumblr page in March 2013. Many followers interpreted the message as a definite end of the band. But now it’s more than a year later, and Tigers Jaw’s just released its third LP Charmer – an album that debuted at number 49 on the Billboard charts, and one the departed members still helped Walsh and Collins record when they decided to carry on as the band’s sole permanent line-up. What came to fruition on Charmer is what Walsh calls the band’s most cohesive record, and what Collins says is “exactly how I was picturing our band would sound recorded at the time.” If the album art for their break-out 2010 self-titled release – an unidentifiable 20-something preparing to eat a slice of stringy cheese pizza – was a sign of Tiger Jaw’s then youthful energy, Charmer’s artwork – an ornate doily handmade by Collins – is an apt sign of the band’s maturity. Walsh and Collins have been through a lot in the past few years that has forced them to grow up, not only stemming from their experiences with Tigers Jaw. Both came to the end of college and were faced with many new responsibilities, along with new freedoms. It’s this transition that Walsh is responsible for Charmer’s darker vibe, both lyrically and in the way it sounds. Though he’s sometimes heavily influenced by what he’s going through personally, writing for Charmer was the first time that Walsh really turned to another medium for inspiration. More specifically, it was interplay between characters on the show Twin Peaks, which is even cited by name in the song “Nervous Kids.” Both Walsh and Collins really enjoy the show. While they’re not writing music or binge-watching TV, both Walsh and Collins have also almost completed all requirements for becoming teachers in their designated fields – Collins for art whilst living in Kingston and Walsh for speech therapy while working at a school in Central Pennsylvania. Tigers Jaw will start their summer tour on Monday when they headline Union Transfer. Playing in Philly feels much like playing to a hometown audience, Collins says, with Walsh adding that it’s one of the next best things now that Scranton is almost devoid of places to perform. They’ll be supported by a new live line-up, including Elliot Babi from Touche Amore on drums, Luke Schwartz from Make Do And Mend on bass and Jake Woodruff from Defeater on guitar. Walsh says that he’s still very much on good terms with the band’s former members. McIlwee is still making music under his solo moniker, Wicca Phase Springs Eternal, while Brier and Mishko remain in Philly’s own Three Man Cannon. “They’ve always been one of my favorite bands and they don’t get nearly as much attention as they deserve,” he says of Three Man Cannon, who released a new album just one week before Charmer was scheduled to drop. When news broke that Three Man Cannon was set to release its new LP, Pretty Many People, on May 27 via Lame-O Records, most headlines made sure to include that the band featured “ex-members of Tigers Jaw.” Drummer Pat Brier deems that widespread association, well, kind of silly. Re-animated punk rock satirists The Dead Milkmen are getting all seasonally affected on us. 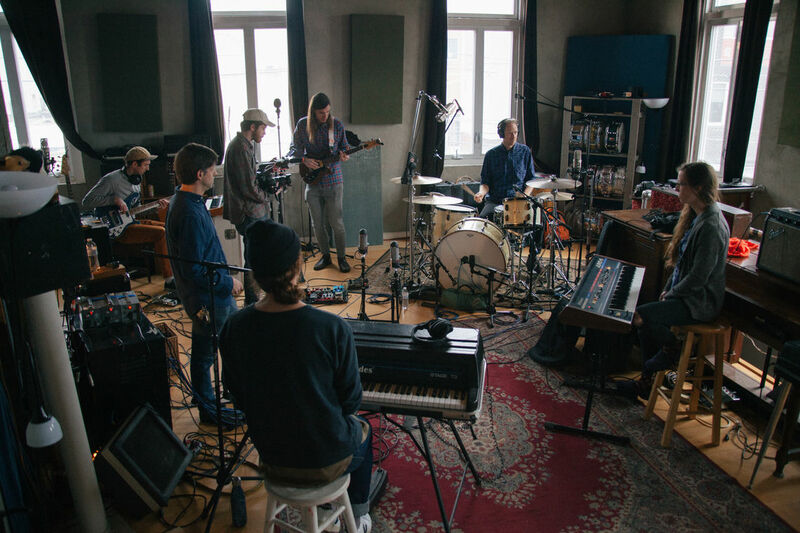 With a big Halloween show at Union Transfer happening at the tail end of this month, the band let some spooky vibes seep into the recording sessions they’ve been holding at Miner Street Studios. Check out this YouTube clip drummer Dean Sabatino posted over the weekend – amp noise, echo, eeriness. It’d be kind of awesome if the entire next album from the Milkmen sounded like this. For more Milkmen, dig into their Key Session from 2010. A while back, I read a little tweet that introduced the idea of something bigger than what I’d heard from Ridgewood, NJ’s Big Troubles. It said, “Damnnnn this band has huge guitars. You might confuse it for 1994…in the best way. The tweet came from someone inside Miner Street Recordings on the first day the band practiced at the Fishtown studio. The quartet was there to record the song “Phantom” for the latest episode of Shaking Through, the online audio and video collaboration between Weathervane Music and WXPN; the session was curated by The Pelly Twins, Jenn and Liz Pelly. Driving to the studio, I was imagining layers and layers of distorted guitars rumbling under piercing riffs. And I wondered how that could possibly come from a band that wrote the dream-pop gem, “Bite Yr Tongue.” (Perhaps it was in Big Troubles’ reach, but it wasn’t something the band had tried on its previous LP, Worry.) I arrived with the Pelly twins as the band was laboring over the guitar part that carries the song’s bridge; lead singer Alex Craig was trying what seemed like the fifth different way to finish it off. The final take took strummed guitar bends into overdrive while multiple sustain tracks derailed underneath. After enough takes, Alex came in the control room so we could all listen to the complete mix of bass, drums, and guitar. It was one of those moments where—as it played back—everyone quietly smiled and nodded heads. The sound was massive. The bass guitar punched back into the verse section before the song stopped altogether. The band hadn’t finished yet—but it was a sample of what could be done in this caliber of studio. Producer (and Weathervane co-founder) Brian McTear oversaw everything that went on in Miner Street. While Big Troubles grew enamored with the possibility of tones and effects, McTear stressed for them to trust the quality of the song. After all, they had access to gear they’d never touched, only listened to, and certainly couldn’t replicate. Via Weathervane Music’s Twitter: Mariner Nine—the band Weathervane Music co-founder and local producer/engineer extraordinaire Brian McTear originally formed with David Boyd, Jason Knight, and Matt Neal (as Mother’s Garden) back in 1990—would have officially turned 20 years old today. (The band’s first show was on January 12, 1991, at The Hill School in southeastern PA—which McTear, Boyd, and Knight all attended.) To celebrate the occasion, the four original members of the band (along with “manager” and honorary member Tyler Harold) returned to the studio last year to record a few new tracks. The three-song EP, appropriated titled “Twenty,” was recorded at Miner Street Recordings in September 2010 over Labor Day weekend. You can listen to the first track, “AZ-yoosa Plane” (featuring lyrics and vocals by McTear) below; all three songs are available for free download via Mariner Nine’s Bandcamp page. You can also check out a handful of older songs (and an extremely detailed bio) at the band’s MySpace page.